World is changing...when will we? Climate change is causing many issues around the globe. To fight this SayTrees plants thousands of saplings in cities and villages. Main aim is to spread awareness among each and every individual who understand their responsibility. SayTrees has been planting saplings from 7 years and have planted thousands of saplings which are slowly turning to trees. Benefits of trees are known to each one of us. But we saw an apportunity where by planting saplings, we would not only help the environment but have direct impact of life of individuals. This is where this project of ours comes into picture. They say "once in your life you need a doctor, a lawyer, a policeman and a preacher, but every day, three times a day, you need a farmer!" . And every year we are seeing that farmers are leading miserable life or even ending their life because of drought or unseasonal rains. What if we give them a source of parallel income ? A sustainable income? What comes in mind when you think of tree plantation and sustainable income? Fruit tree plantations. Where farmers will have fruit trees in their land and they can have a source of income by selling fruits. We have initiated a project to plant 10,000 fruit bearing saplings in next 2 months. We already initiated this on 10th October where 500 Mango sapligs were planted with farmers of anantpur district. 9500 more to go. This is a pilot project and if successful this will be replicated in many more villages across the country. We are looking for corporate and individuals to come forward and support this cause. 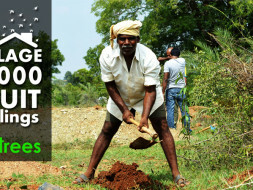 Donate funds to plant saplings with farmers. 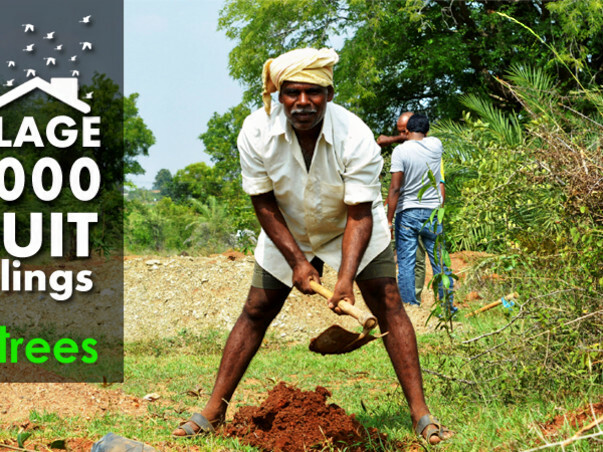 With a cost of 90 rupees per sapling, you would be able to give hope to farmers in villages. Plant fruit bearing saplings with farmers to give them sustainable income. 6. Shelter and fodder for the animals and birds. - Fruit saplings would be planted. - Pics of plantation will be shared with donors. - All plantation details will be shared with donors. - Status of growth of saplings will be shared with donors. More saplings planted. 5 farmers helped so far.